I've never really been a fan of point-and-click adventure games. Myst was a little too cerebral for my 9-year-old mind to grasp, and I didn't have the patience to appreciate the subtle humor of a game like The Secret of Monkey Island. Most of all, pixel-bitching - clicking every square millimeter of screen real estate in the hopes of finding that one item you need to advance the story - never seemed like the kind of mechanic you'd want to build a game around. Thankfully, Little Wheel, from Slovakian studio OneClickDog, neatly avoids these problems by highlighting exactly the spots you need to interact with to progress through the game. You begin your journey as the sole living robot in a teeming city of thousands of machines who have laid dormant for millennia. It's up to you to traverse the dilapidated landscape and restart the generator that will restore energy to the city's inhabitants. The puzzles are simple enough that you're never stumped for long, especially since the game includes a built-in walkthrough to help you through any rough spots. Of course, ease of operation isn't what makes Little Wheel worth playing. 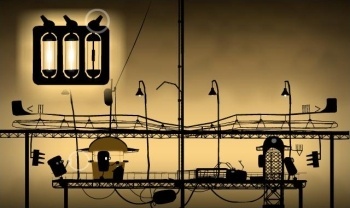 Instead, it's the game's gorgeous 3-D silhouettes, silly animations and unique world design that sets it apart. And at only 20 minutes long, you won't have to worry about losing a half-day of productivity to a browser game ... this time.